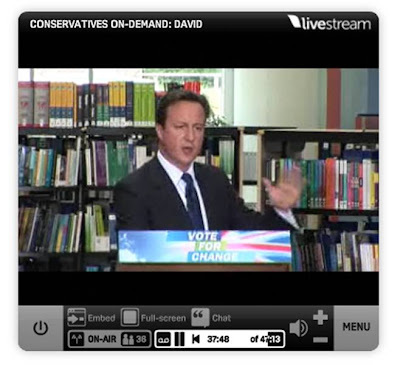 Yesterday, David Cameron, leader of the UK Conservative party, gave a speech to the Open University. This speech was streamed live on the internet and questions were then taken from the event audience, from Twitter and through CoverItLive. 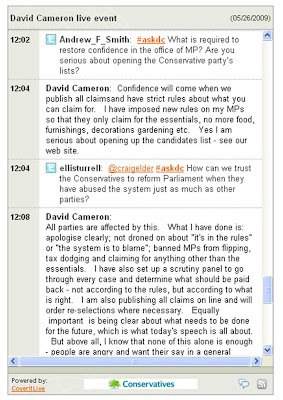 After the event David Cameron also recorded an AudioBoo for @documentally. Social is fast becoming an important part of the UK political scene (blogs forcing advisers to resign, policy being announced on YouTube etc) and it may well be that regardless of policy, David Cameron is in a better position than Gordon Brown to take advantage of it. Whilst social media will not win an election by itself, it will be interesting to see where this all ends up - especially as the UK electoral advertising restrictions (no ads on broadcast media) have not been amended to include YouTube, streaming and other online areas.